The Office of Lasallian Education honored Brother William Mann, FSC, D.Min., president of Saint Mary’s University of Minnesota, with the Brother John Johnston, FSC Award at the Distinguished Lasallian Educator Awards Banquet at the conclusion of the Huether Lasallian Conference Saturday, November 17, 2012. 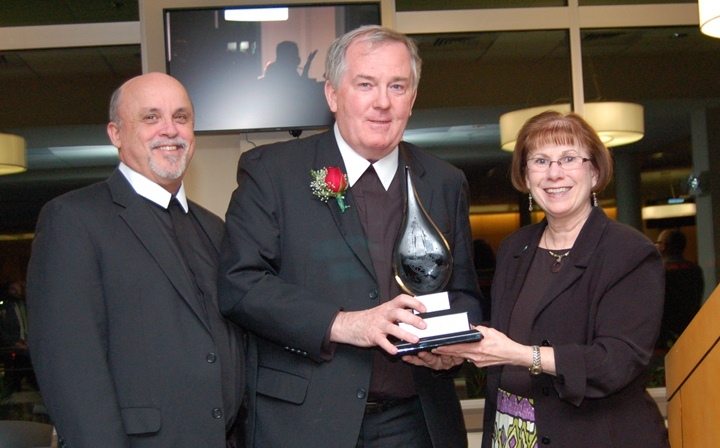 Read more about the Distinguished Lasallian Educators who were honored. This award is the highest honor given in the Lasallian Region of North America. It recognizes Brothers and Lasallian Partners who, like Bro. John Johnston, have endeavored on the international or Regional levels over many years to advance the mission of providing a human and Christian education to the young, especially the poor. The award is presented to those whose leadership, teaching, evangelization, or scholarly research and writing have borne witness to an abiding faith and zeal, and whose efforts have had a transformative impact upon the founding story as lived today. Brother William Mann has exemplified these qualities over his more than 40 years of service including as a teacher, leader, lecturer, and scholar. He has touched the hearts of Lasallians in his work at many levels, from single schools to conferences to the headquarters of the worldwide Institute of the Brothers of the Christian Schools. Bro. William is currently the 13th president of Saint Mary’s University of Minnesota, which is celebrating its 100th anniversary this academic year. Not only does he encourage academic excellence at every level at Saint Mary’s, he has focused on specific initiatives that strengthen the Lasallian Catholic nature of the University. Prior to becoming Saint Mary’s president in 2008, Bro. William served as Vicar General, the second highest officer in the worldwide Institute. He also previously served as Provincial and Auxiliary Provincial of the former Long Island-New England Province. Bro. William is a founder and long-term lecturer at the Buttimer Institute of Lasallian Studies. He also inaugurated and now serves at an editor of AXIS: A Journal for Lasallian Higher Education, an electronic journal serving Lasallian colleges and universities. These are just some of the many contributions for which Bro. William was honored.